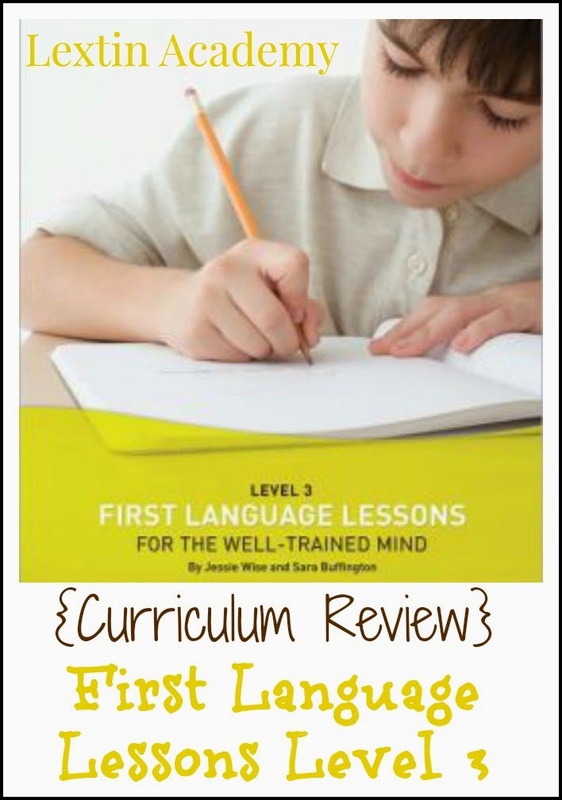 Curly (age 9) is now in her 3rd year of our favorite grammar program – First Language Lessons. I’m sad that next year we will complete the last level of this program and I will begin the search for a new program. 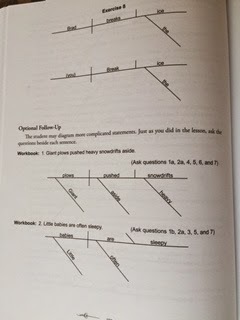 This program uses memorization and diagramming to teach grammar concepts. The program contains a teacher guide with scripted lessons and answers to all of the questions and diagrams. There is also a student book (which can also be purchased in the downloadable version). This contains all the exercises for the student including lines for writing answers and blank diagrams to be completed. The program has 110 lessons and is designed to be completed at the rate of 3 lessons per week. We actually complete the program at the rate of 4-5 lessons per week and then use the remaining time in our school year to do an editing program and a vocabulary workbook. First, the guide instructs me to review the poem from Lesson 46. Next I read the definition of a preposition and have Curly repeat it 3 times with me. Then we read through the list of prepositions printed on her worksheet page. After she has read through the list, I have her practice saying it from memory. For the second exercise, I have Curly read the sentence on her page. I ask her to find the preposition and circle it. I show her where the prepositional phrase is in the sentence and she underlines it. We then work through 3 more sentences in the same way, with me guiding her to find first the preposition and then underline the entire phrase. Then I have Curly complete the next 5 sentences on her own, finding the preposition and then the full phrase. At the end of the lesson, there is a dictation exercise of 2 sentences. I dictate these to Curly and have her mark the prepositions and prepositional phrases. What do I like about the program? 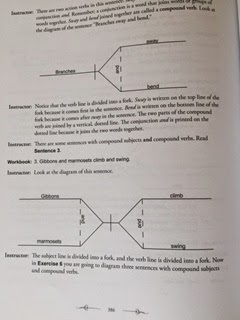 The program includes diagramming which I feel is an important way to see how the words in a sentence work together. It also helps visualize the various parts of speech. The lessons are very incremental and teach only one concept at a time. In this way, the lessons build on each other throughout the program. There is a good amount of review built in to the program. Many lessons are review lessons that recap what was taught in previous weeks. The program has the student memorize definitions of the parts of speech as well as lists of prepositions, state of being verbs, and helping verbs. This has helped Curly quickly identify the part of speech of many words because she knows the definition so well. The program also includes poetry to memorize, passages to copy, suggested dictation, and short passages for narration in a few of the lessons to round out the program and make it feel more complete. The lessons are scripted for the teacher and include what to say, what questions to ask, and have all the answers included right in the text of the lesson. The lessons are short and the student pages include the lines for writing or completing the diagrams so that it is not too overwhelming for the student. The program doesn’t require any planning or prep time (or extensive previous knowledge of grammar and diagramming) as each lesson walks the teacher through the concepts. Much of the lesson can be completed orally (with some written work on the worksheet pages). This makes grammar time feel more like a conversation than a lesson. First Language Lessons has given Curly such a solid foundation in grammar. She can easily recognize the part of speech of words in a sentence and because of the diagramming practice she can visualize how the words work together. Now that she is beginning to write original sentences and short paragraphs she is cognizant about her word choice and I can see how she has learned to construct a grammatically correct sentence. Plus, it’s incredibly easy to use for me and requires no planning or prep work. I only wish there were more levels! ← Where Is Writing with Ease Taking Our Writing Skills? We also tried first language lessons at home. The comparative lack of levels is a bit difficult. But I loved it. Once I got to level four I had to search for alternative options for language arts. Yes, we have loved the earlier levels but I’m not loving the later levels. We even tried the middle school curriculum and it was not a good fit at our house. So, we’re now using Abeka workbooks. My kids love them (which surprised me!). They are colorful and straightforward and my kids are retaining the information very well because there is a lot of review.